Linnie A. Sickmiller, 91, formerly of Cedar Springs, went to be with her Lord on Monday, April 21, 2014 at Capitol Area Health & Rehab in Lansing. Linnie was born May 11, 1922 in Mecosta County, Michigan the daughter of Manily and Flora (Johnson) Brown. 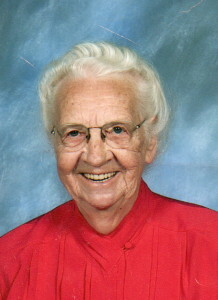 She was a member of Pilgrim Bible Church and a dedicated Christian all of her life. She was preceded in death by her husband, Rev. Elmer Sickmiller; her parents, three brothers and three sisters. Surviving are a brother, Nahum (Viola) Brown; step children and step grandchildren; many nieces and nephews; best friend, Dorothy Zank. Visitation and funeral was held Wednesday, April 23 at Pilgrim Bible Church, 361 Pine St., Cedar Springs. Pastor Michael Shiery officiating. Interment Elmwood Cemetery, Cedar Springs. In lieu of flowers, memorials may be made to Pilgrim Bible Church.